The Freestyle Custom Darkroom Apron - One size fits all! This apron has been manufactured for you, the darkroom enthusiast, and is designed to meet our strict guidelines of quality and durability. 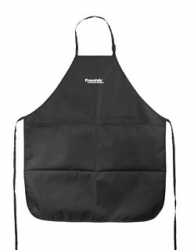 Made of Heavy Duty #600 Denier Cordura with a water resistant PVC rubber waterproof backing, this apron is THE solution for protecting your clothes from photographic chemicals. The extra large front pockets can hold your notepad, gloves, writing utensils, thermometer, etc. To clean the fabric - place the apron on a smooth surface and scrub it with a wet soft sponge. For tougher stains use a MILD liquid dish-washing soap - RINSE thoroughly with cool clean water on both sides, using a clean wet sponge to remove any excess, leftover, detergent. DO NOT MACHINE WASH OR DRY. ALLOW APRON TO AIR DRY ONLY.